August 30th in Wordpress Plugins by Wordpress Jedi . 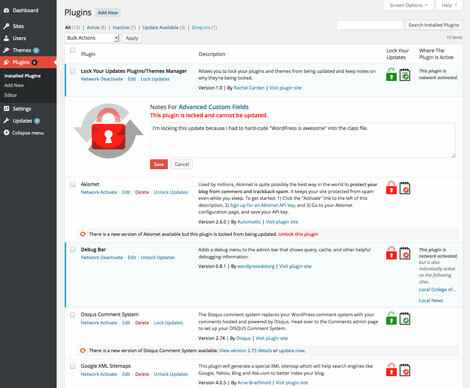 Lock Your Updates: this plugin lets you lock your plugins and themes from being updated and keep notes on the reason. Plugin Notes: this plugin lets you make note of modifications you have made to each plugin and share them with your team. Plugin Memorandum: another plugin that lets you write a memo for each plugin you have installed. Have you found better scripts to store notes on your plugins? Please add them here.